It would otherwise be another innocuous ODI series, but Australia’s tour of England takes on extra significance this time around. Join The Roar for live scores and coverage of the first ODI at The Oval from 10pm (AEST). Australia have undergone a changing of the guard following the bungled tour of South Africa and the ball-tampering scandal, with this being new coach Justin Langer’s first chance to get his hands on the team. With the World Cup in England just 12 months away, this tour gives the tourists some vital preparation time. Steve Smith and David Warner are obviously still suspended, so the team will be led by wicketkeeper Tim Paine and opening batsman Aaron Finch. Exacerbating the issue is that the side’s three top quicks – Mitchell Starc, Pat Cummins and Josh Hazlewood – are all back at home with injury. It means the pop-up attack will feature Kane Richardson, Jhye Richardson and probably Billy Stanlake, while Nathan Lyon has been recalled to the limited overs team ahead of the dropped Adam Zampa. 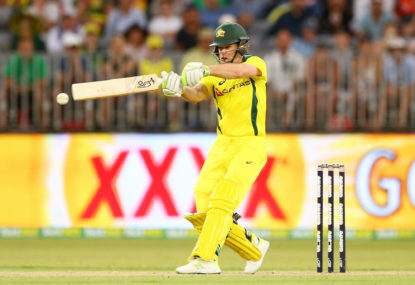 Australia have had two warm-up wins ahead of the series, against Sussex and Middlesex, with D’Arcy Short, Travis Head and Marcus Stoinis all showing some form to confirm their spots in the team. England, who won their ODI series Down Under earlier this year after a failed Ashes campaign, will be out to kick Australia while they are down. They have their own injury issues, with gun all-rounder Ben Stokes and pace bowler Chris Woakes out of action, but the squad is still strong. Their last ODI commitment was way back in February, when they beat New Zealand 3-2, and they will be confident heading into this series. Alex Hales and Jonny Bairstow have really come into their own at the top of the order and with other big hitters like Jos Buttler and Eoin Morgan featuring, they will look to pick the Aussie attack apart. Their bowling, while having more experience, isn’t necessarily better pound-for-pound and they will look to win the game with the willow in hand. England have the better team on paper and with home advantage, it’s hard to see them dropping this first ODI. Be sure to join The Roar for live coverage of the first ODI between England and Australia from 10pm (AEST) and don’t forget to add a comment in the section below.